▶ SoldThis listing was sold on Oct 6, 2017 for the price shown here. SHOWPLACE w/Tons of CURB APPEAL!!! New driveway/stamped sidewalk leads to large welcoming front porch. Open newer front door to generous front entry foyer. SPECTACULAR kitchen w/abundant custom cabinetry w/crown molding, bead board sides, glass fronts, ss/black appliances;quartz/granite counters;breakfast bar/island;kitchen desk;walk in pantry;breakfast room. Spacious laundry room, dining room, formal living room, family room w/gas fireplace complete the main floor. Master bedroom Ste & 3 more generous bedrooms(one w/french doors) are upstairs. All bathrooms have been updated. New paint, light fixtures, faucets, 2" blinds, flooring thru-out. 2 HVAC systems. New sliding glass doors lead to park like outdoor space;15x30 stamped patio;hot tub (electric ready for a pool), wood fence;landscaping, pergola-perfect for entertaining. Utility shed on foundation. 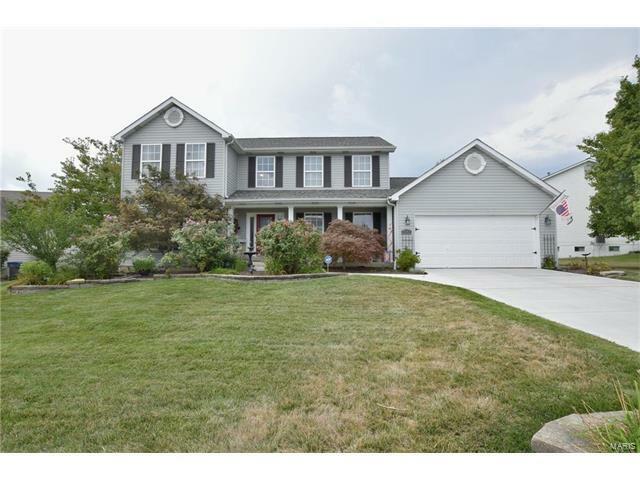 Great Ft Zumwalt schools, location close to amenities/easy highway access. Words can't describe the beauty of this home, inside & out. HWY K TO LEFT (WEST) ON MEXICO RD; LEFT ON WASHINGTONS CROSSING DR TO RIGHT ON FIFE AND DRUM TO LEFT ON SPANGLE WAY CT. HOME IS ON THE RIGHT.